Weill Cornell Medicine-Qatar (WCM-Q) today celebrated the fifth anniversary of its innovative and remarkable health campaign Sahtak Awalan: Your Health First. In the five years that Sahtak Awalan has been operating it has made a real impact on the health landscape of Qatar, influencing and educating the community to lead healthier lives for the benefit of their health and wellness. There has also been a major focus on the nation’s youth, advocating preventative measures that will help the next generation stay healthy and rise to the challenges of Qatar National Vision 2030. VIPs including Her Highness Sheikha Moza bint Nasser, heard the story of the campaign, from its inception to its future plans. The audience, which included more than 1,000 schoolchildren who have acted as ambassadors for the Sahtak Awalan campaign, heard how the campaign was inspired by WCM-Q’s mission to improve healthcare both now and for future generations, and by the specific health issues affecting Qatar, namely diabetes and obesity. They also heard how Sahtak Awalan has promoted prevention and small lifestyle changes that could be easily achieved yet would make a big difference to people’s health and that of their families by preventing disease from striking. During the event, the audience was told about the campaign’s achievements with figures and facts and many successes along with hearing its future 5 year strategic plans to building up on the success. Launched in 2012 in association with the Ministry of Public Health, Sahtak Awalan’s strategic partners include Qatar Foundation, the Ministry of Education and Higher Education, Occidental Petroleum, ExxonMobil, and Qatar Olympic Committee. The leaders of each of those organizations appeared in a film explaining what Sahtak Awalan meant to the health of Qatar and why they were committed to its goals. 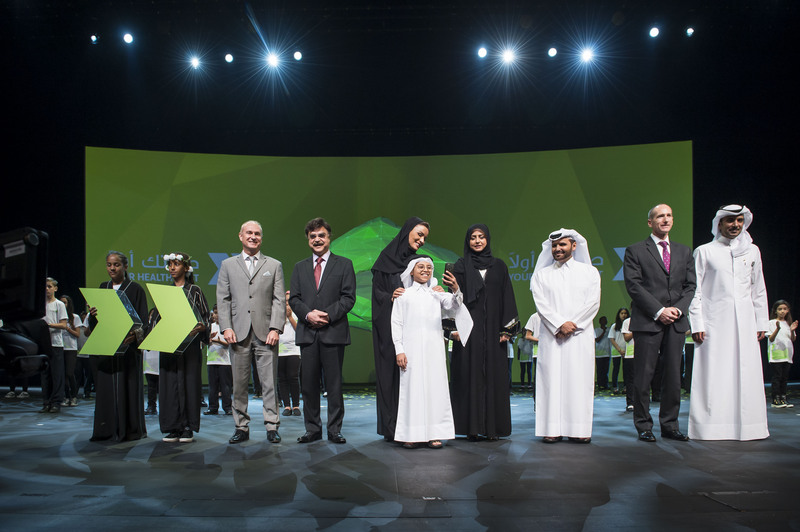 Her Excellency Sheikha Hind bint Hamad Al Thani, serves as Vice Chairperson and CEO of Qatar Foundation. Her Excellency Dr. Hanan Mohamed Al Kuwari, Minister of Public Health, said good health among Qatar’s people is vital to the success of the nation. His Excellency Dr. Mohammed Abdul Wahed Al-Hammadi, Minister of Education and Higher Education, applauded the fruitful partnership with WCM-Q in implementing Sahtak Awalan in schools across Qatar for the fifth year running. HE also praised the many initiatives run by Sahtak Awalan such as Project Greenhouse and the Poster Competition, which inspired school children to live healthy lives. “What really distinguishes Sahtak Awalan from other health campaigns is that it researches our community and delivers well-thought-out solutions to the most pressing health issues. For example, Project Greenhouse promoted a balanced and healthy diet and encouraged school children to grow their own plants at home. School children have been involved in research and poster competitions on issues such as smoking, road accidents, unhealthy eating habits and related diseases such as diabetes, obesity, heart disease and cancer. This interactive involvement of students is of vital importance taking into consideration the prevalence of these diseases and bad habits in our society,” HE said. HE also praised the crucial role of WCM-Q in spreading health awareness and harnessing all its scientific, research, academic and human resources to raise awareness in schools. This helps students acquire the necessary knowledge and skills, contributes to achieving education goals and underscores WCM-Q’s commitment to CSR in addition to its academic world-class programs. “I would like also to thank our students for their active participation in Sahtak Awalan and its many initiatives, and for spreading the word to their families and friends and adopting healthy eating habits. The school is definitely the best place to instill good habits from early age, and I urge all school administrations and stakeholders to work with Sahtak Awalan and adapt the school environment to make the best use of the campaign,” HE concluded. Dr. Thani Al-Kuwari, Secretary General of Qatar Olympic Committee, praised Your Health First for its inclusive attitude to sport and physical activity. These sporting activities have included The Color Run, which was brought to Qatar for the first time by Your Heath First and has seen has seen 13,000 people of all ages and abilities run the five-kilometer course, and also The Challenge. This indoor, inter-schools sporting challenge has seen more than 1,000 children take part in the event. The audience at the event was able to visit set-ups of some of Sahtak Awalan’s most successful and innovative initiatives. These include Project Greenhouse, the School Canteens, Yalla Natural, Your Healthy Choice, and the smoothie bikes. Dr. Javaid Sheikh, Dean of WCM-Q, said: “Healthcare is not just about reacting to an illness with medication and surgery, it should primarily be about cultivating healthy lifestyles to prevent chronic illness. As a doctor I would prefer that people look after their health and that of their families so they never have to see the inside of a hospital. “In that respect Sahtak Awalan has been a true inspiration as it has taken lessons about good health to Qatar’s community and made those lessons attainable. Sahtak Awalan has helped make the college’s commitment to public health a reality. Dr. Sheikh’s words had particular resonance precisely because of Sahtak Awalan’s preventative stance. Project Greenhouse, for example, has seen greenhouses, pots, soil and seeds given to primary schools across Qatar, allowing the children to grow and then eat their own fruit and vegetables. Not only does this provide lessons about vitamins, minerals and eating healthily, it also encourages them to try new foods while also learning about the environment and sustainability. Similarly, Your Healthy Canteens has provided dietary information to students and revamped school menus, allowing them to make informed choices about what they eat. For adults, Yalla Natural has given dozens of cooking demonstrations at public events, showing how great-tasting, healthy meals can be made in a mater of minutes. Shopping has also been made healthier, with Sahtak Awalan’s dietary and nutritional information in many Al Meera supermarkets. These projects are ongoing and will continue to make a help improve the health of the future generation, in line with Qatar National Vision 2030. Alistair Routledge, President and General Manager for ExxonMobil Qatar, said: “ExxonMobil Qatar has supported the Your Health First campaign, an initiative of Weill Cornell Medicine – Qatar in association with the Ministry of Public Health, since its inception because we want to increase public awareness of critical health issues that impact the community we live and work in. “Our support for the campaign underscores our commitment to building a healthier Qatar and maintaining a workforce that can sustain Qatar’s bright future, in line with the objectives of the Qatar National Vision 2030. We are very proud of its success over the years and look forward to seeing more and more outstanding outcomes in the future,” he added. The event also heard from YHF ambassador Dr. Jowhara Al Qahtani, of WCM-Q’s Class of 2013, who is currently taking her surgery residency at Hamad Medical Corporation. She spoke of how Sahtak Awalan had inspired her to lose weight and run a half marathon, and how she is now in training for a full marathon. She also told the audience that health and fitness are infectious and that she has friends and colleagues who now join her on her runs. WCM-Q has always believed in the role of its alumni and students to be ambassadors for Sahtak Awalan, helping to spread awareness about good health. These ambassadors include Nasser Al-Kuwari (Class of 2022) who recited from the Holy Qur’an during the ceremony, Dr. Bothina Al-Mulla (Class of 2011), Dr. Abdulwahed Zainel (Class of 2014), Dr. Alreem Al-Nabti (Class of 2016), Ahmad Al-Shahrani and Ahmed Saleh and Ahmed Al-Qahtani (Class of 2017), Abdulaziz Al-Thani, Abdulrahman Al-Abdulmalek and Khalid Al-Marri (Class of 2018), Fahad Al-Marri (Class of 2019) and many others who have helped YHF achieving its goals.